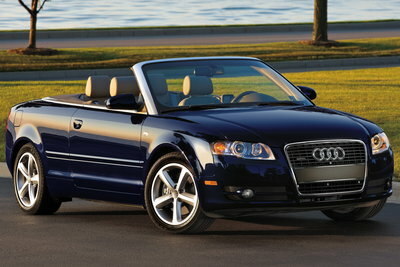 The A4 cabriolet is an understated convertible coupe. Spanning a wide price range from the $40,000 entry-level four-cylinder model to the range-topping $55,000 V8-powered S4 performance model, the A4 most directly competes with BMW's 3-series convertible. While the newer 3-Series offers a retractable hard top, the A4 offers a fully automated soft top. The A4 Cabriolet is the last of the A4 models on the previous platform. A new model is expected for the 2010 model year. S Line exterior upgrades become standard on 2.0L and 3.2L models. New 17 inch wheels on the 2.0T models, and new 18 inch wheels on 3.2L models.